To start with, in the morning our guide and driver will come to pick you up at the hotel in Hue and transfer to Phong Nha National Park. Firstly, we will pass by many green rice fields, rustic villages along the way. So, you can feel a peaceful scenery of Vietnam’s countryside. Next, we will come along Ho Chi Minh Trail that became legendary road in Vietnam war. Therefore, North Vietnamese Army built it at the beginning of 1959 to transport weapons, foods, human supplies for the South Vietnam. The trail represented the bravery, sacrifice, solidarity of the Vietnamese people in the revolution of country’s unification. As a result, North Vietnam infiltrated into the South and they successfully invaded and took over South Vietnam in 1975 to end the war. Then our trip continues with a smooth ride over hills, jungles of the mountains and you will see massive rubber and coffee plantations on the way as well. Orrival at Phong Nha National park, we will embark on boat for boat trip approximately 30 minutes on the Son river to reach to the cave. Hence, the scenery in Phong Nha area comes out like a painting: the water is so blue clear water with small houses on two sides and there is the mighty mountain range in different shapes in front of us. All is like a colorful watery painting. 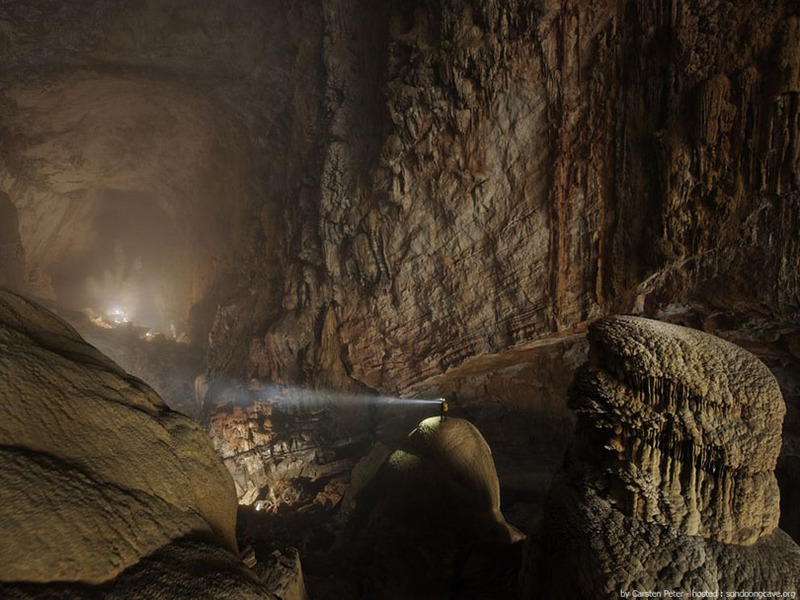 During the war, Phong Nha cave was a part of historic Ho Chi Minh trail and the local people used the cave as a shelter during some battles in the 1960′. Moreover, the cave was also the place where the Cham settled inside the cave in the old days. The Phong Nha park is so well known thanks to its seven wonderful things: the longest underground water, the widest and highest cavern entrance, the widest and prettiest sand bank and rock formation, the prettiest underground cave, the most miraculous and magnificient stalactite, the longest underground river in Vietnam, the widest and prettiest cavern and passageway. Reaching the cave entrance, the boat leads us inside the cave and you will start to admire the result of the Mother Nature. As everytime we go in, thousands of stalactites and stalagmites coming out look like we are being lost in a fairyland. Therefore, the formation of stalactites happened millions years ago by an absorbance of water. So, this process has dissolved, washed away limestone for millions of years, creating a system of caves, grottoes inside the cave. After that, we keep going further in and exploring another part of the world’s longest underground river. Next, on the way out, we will walk on fine sand to watch more of stalactites and stalagmites coming down from the rock ceiling and rising up from the floor. As we walk up just a few steps, we can relate the picture of rock formations in the cave to the scene of Sapa in the north of Vietnam with waterfalls and terrace fields. You will definitely have a great shoot with this. After all, we come out and then continue our trip to visit Tien Son cave. Hence, this cave is well known for its magical stalactites, and we can hear some sound coming out from the rocks like someone is knocking on the gongs. 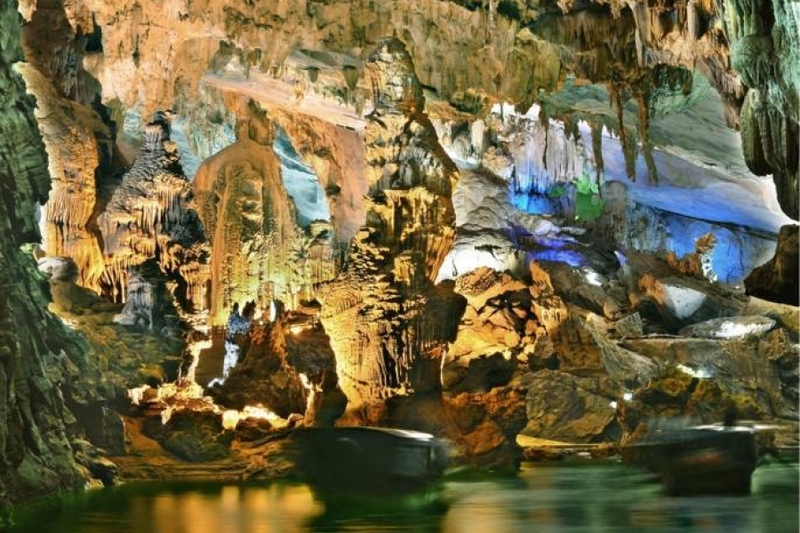 The Tien Son cave is also known as masterpiece of the nature and the scenery is just stunning. Finally, we will walk back down stairs and take boat trip back to the dock. From here, our car and driver will transfer you back to the hotel. 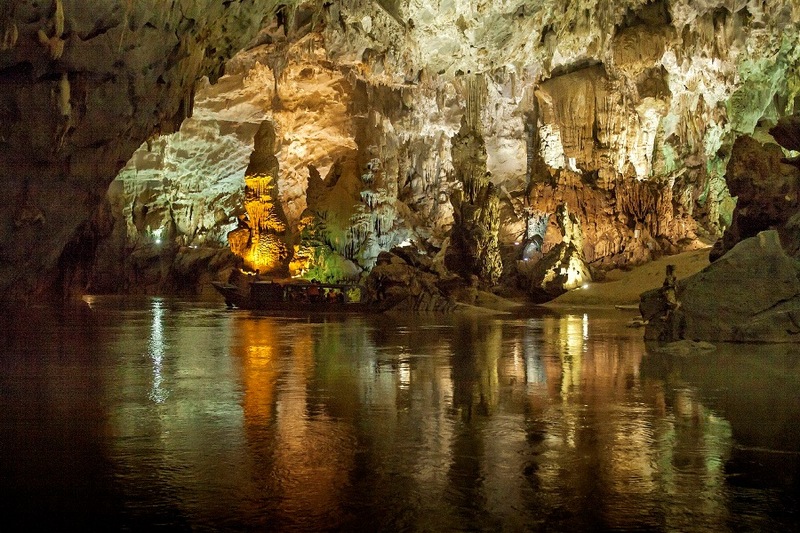 Then, our Phong Nha cave tour from Hue will end here. 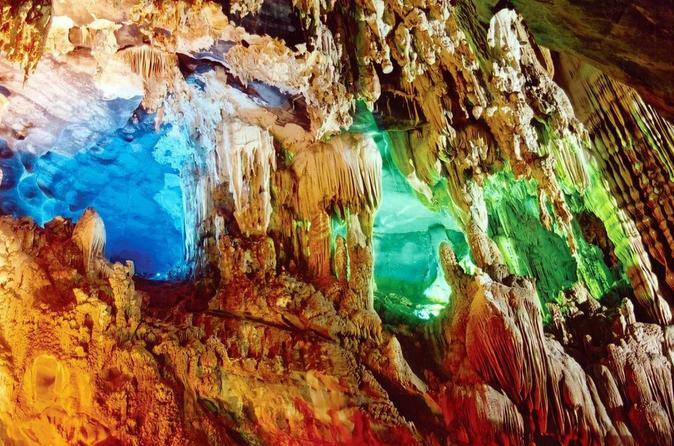 What do we offer in this Phong Nha cave tour from Hue? 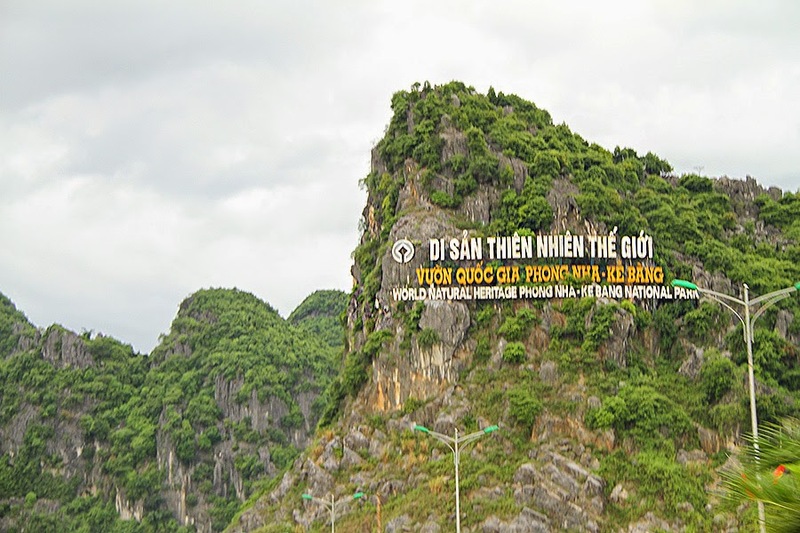 Firstly, joining this tour with Premium Travel Vietnam, we will help you explore the kingdom of caves and grottoes in Vietnam – Quang Binh Province. By participating in this tour, you will discover an eternal beauty of the nature in Phong Nha National Park. Also, we will find out the process of forming such breathtaking stalactites and stalagmites in this land. Since then, we will harmonize in this mighty nature of Phong Nha Park and we will love it more. Kindly send an email to us at premiumvietnamtravel@gmail.com or reach us via Whatsapp/Viber at 0084 979613777. We will promptly response to you. In months of October, November, December, January, February; it normally rains in Phong Nha, let’s bring rain coats with you. For the rest of the year, it is usually pleasant and nice.